Welcome to the magnet mine! Dig away to find the buried magnetic stone. 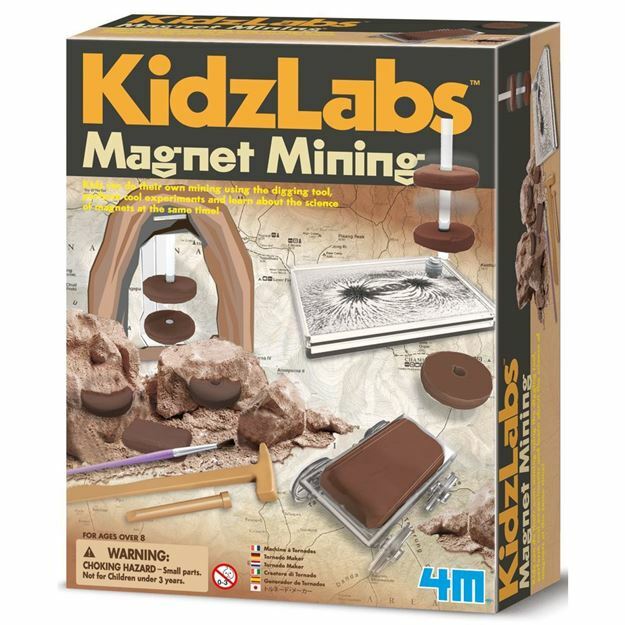 Then try the fun experiments to learn about the facinating topic of magnets and magnetism. Magnetic levitation… Magnetic mining cart…. Anti-gravity cave… Fun magnetic dust… Contents: 1 x block of plaster containing 2 x ring magnets and 1 x bar magnet, 1 x set of digging tools and bush, 1 x case containing iron powder, 1 x template, 1 x stand, 1 x mining cart body, 4 x wheels, 2 x axle, 1 x wand and detailed instructions. Age 5+ years. Part of the KidzLabs range. Distributed in New Zealand by Holdson.